Monster Jam is, nominally, a competition, but really it’s just a cool monster truck show—and apparently a profitable one. Or at least profitable enough for toymaker Mattel to recently start their own competing show, the end result of a simmering dispute between the two that has been stewing for months and closed the door on a 20-year partnership. It all started in July, when, for whatever reason, Feld Motor Sports, the company that operates Monster Jam, told Mattel that it was ending its professional relationship, according to court documents. The two companies had worked together since 1999, with Feld licensing the Monster Jam name and logos for its trucks to Mattel, which in turn produced toy trucks and other merch sold in stores and at Monster Jam events. When Feld decided to go somewhere else for those services, it expected Mattel to keep making toys until December 31, when its license expired. Instead, Feld says in a lawsuit filed the day after Christmas that what Mattel infringed on its trademark and deliberately undercut the supply of Monster Jam toy trucks. Mattel literally took their toys and went home, the suit alleges, while also starting up the rival monster truck series, which stars Bigfoot, among other trucks, the designs of which are similar to some in Monster Jam. Instead of completing the license term in good faith, Mattel began a course of bad faith conduct, diverting the use of manufacturing molds developed pursuant to FMS’s license and attendant toy production away from the licensed FMS-authorized MONSTER JAM® toy trucks to a new start-up line by Mattel branded as “Hot Wheels® Monster Trucks” (“Hot Wheels Monster Trucks Line.”). The Hot Wheels Monster Trucks Line toy production includes trucks with infringing designs confusingly similar to the distinctive trade dress of some of FMS’s famous monster trucks. Mattel also began usurping FMS’s business opportunities with retailers in 2018 by failing to supply retailers with requested MONSTER JAM® products licensed exclusively to Mattel, so as to better enable Mattel to engage in self-dealing by producing and selling its own Hot Wheels Monster Trucks Line in lieu of MONSTER JAM® products and in support of its upcoming new live event tour, “Hot Wheels Monster Trucks Live,” opening in January 2019 as announced publicly in November 2018. The facts supporting these allegations are detailed below. The new Mattel series was announced on November 12; a few weeks later Mattel said that Bigfoot, the world’s most famous monster truck, would be a part of it too. Its first show was January 5 at an arena in Edinburg, Texas, with more events scheduled in various states through March. On paper, the series is more or less a facsimile of Monster Jam, which isn’t much of a surprise considering that Monster Jam says it is organized by former Monster Jam employees, according to the suit. Hot Wheels Monster Trucks Live’s own description of itself is pretty much your standard Monster Jam event, though they also took the opportunity to take a shot at Monster Jam too. The whole series isn’t terribly original, in other words, which is in large part what prompted the lawsuit. Even before the rival monster truck series got going, there were signs that Mattel might not be committed to finishing out the year. There were, Feld says, mysterious shortages of Monster Jam toy trucks that began to occur, with sales of the trucks in the third quarter of 2018 well down compared to the same quarter in the 2017. Feld also accuses Mattel of refusing to provide Monster Jam toy trucks to retail outlets, kneecapping a part of its business by “secretly and deliberately” undersupplying Monster Jam products, the suit says. Moreover, while Mattel secretly and deliberately undersupplied MONSTER JAM® products to retailers, it simultaneously insisted that it had not breached the agreement, and as such, should be entitled to remain the exclusive licensee of FMS MONSTER JAM® toy vehicles through the remainder of the term, thereby unlawfully blocking market access to FMS for its MONSTER JAM® toy product line. As all of that was happening, Feld also says that Mattel ripped off the designs and names of trucks for its own line of toy trucks tied to Hot Wheels Monster Trucks Live. That last one I almost respect, since Mattel could’ve named the Hotweiler after any other dog or beast, but chose to stick with this particular breed. You could say that similarities in the names is plain laziness, but how about the truck designs? Feld says in the suit that Mattel simply repurposed the molds they’d been using for Monster Jam trucks. Feld thinks the toy trucks look similar because of a practical consideration, in that Mattel is using the same molds they used to make Monster Jam trucks—but this time for their own trucks, lightly repackaged. Upon information and belief, at some point in 2018, Mattel diverted at least some or all of the molds it had developed pursuant to the MLA from the manufacture of licensed MONSTER JAM® toy trucks to manufacture of its own Hot Wheels Monster Trucks Line. Similarly, Mattel had been making and selling BONE SHAKER toy trucks under the MONSTER JAM® line, but then introduced BONE SHAKER toy trucks under the Hot Wheels Monster Trucks Line that are virtually identical in shape and construction to the BONE SHAKER toy trucks previously sold under the MONSTER JAM® line. There seems to have been some effort to come to reconcile, but, according to the lawsuit, in December Mattel ghosted as the two companies were trying to negotiate a settlement, leading to the lawsuit. 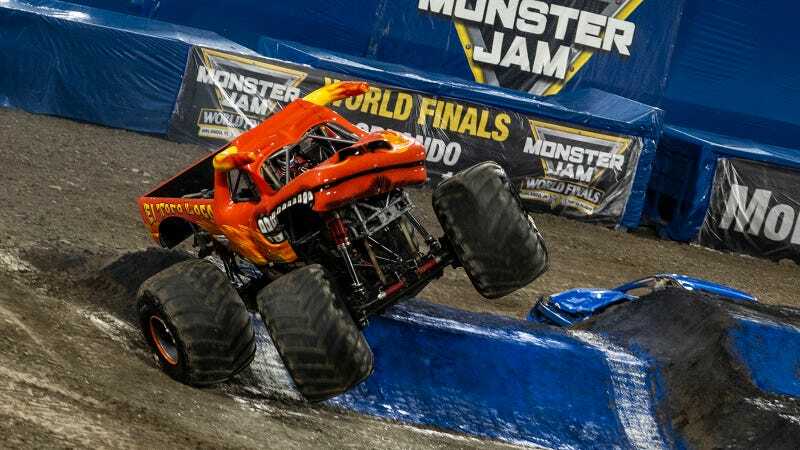 The Hot Wheels Monster Jam truck—one of the more popular trucks in Monster Jam’s lineup—is no longer listed on the Monster Jam’s website, though getting Bigfoot to buy in is a much bigger deal. Bigfoot used to participate in Monster Jam, but hasn’t since the late ’90s after disputes over image rights and money. And I think Bigfoot is still the world’s most popular monster truck, or at least the one that most normals have a chance of knowing, right behind Monster Jam’s own star, the Bigfoot rival Grave Digger. Now they’ll be again competing head-to-head again—if not quite. You can read Feld’s full civil complaint against Mattel below.